Whichever configuration of the Honda Civic you choose, sedan or hatchback, you’re guaranteed a vehicle that is reliable and fun to drive. However, in today’s automotive market, a passenger car needs have all of the latest advancements as well. Fortunately for Civic drivers, both the Honda Civic Sedan and the Honda Civic Hatchback are among the most technologically advanced vehicles available. The base trim of the Honda Civic Sedan is equipped with plenty of advanced amenities. Siri® Eyes Free compatibility not only makes interacting with your mobile devices simpler, but safer as well. The Civic Sedan also comes standard with a multi-angle rearview camera, which is helpful for those tricky parking maneuvers. 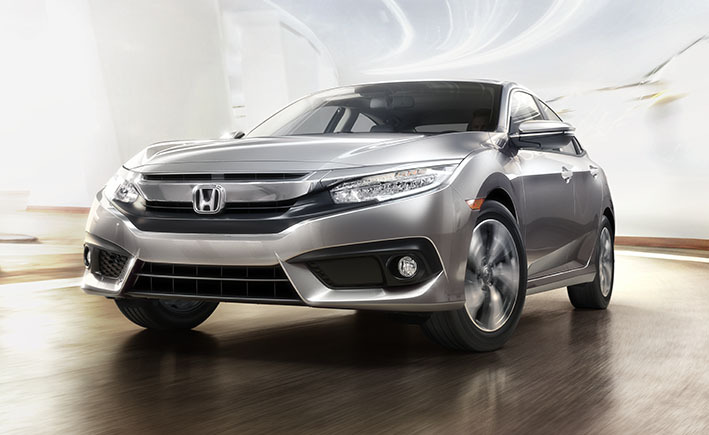 The Civic Sedan’s best technologies are equipped on its higher trim levels. The previously mentioned rearview camera receives dynamic guidelines on the LX trim, and other safety systems like Lane Departure Warning and Forward Collision Warning, are standard on the SE trim level and above (excluding the Si trim). The Honda Civic Hatchback includes even more standard technologies than the Civic Sedan. Apple CarPlay™ and Android Auto™2, only available at the higher trims on the Civic Sedan, are standard on the Civic Hatchback’s base trim level. The Honda Civic Hatchback Sport adds a proximity key entry system — complete with a push button start — and Honda LaneWatch™ blind spot display. The best features are reserved for the Civic Hatchback Sport Touring trim. Not only does this model include the advanced Honda Sensing™ safety suite, but it also has a 542-watt AM/FM Premium audio system with 12 speakers. Between the Civic Sedan and the Civic Hatchback, you’re sure to find plenty of technology that both you and your passengers will love. Come explore our lineup of Honda Civic vehicles at St. Albert Honda. 1None of the features we describe are intended to replace the driver’s responsibility to exercise due care while driving. Drivers should not use handheld devices or operate certain vehicle features unless it is safe and legal to do so. Some features have technological limitations. For additional feature information, limitations and restrictions, please visit www.honda.ca/disclaimers and refer to the vehicle’s Owner’s Manual. 2Only compatible with certain devices and operating systems. Operation may be dependent upon: 1. connection to vehicle’s built-in Wi-Fi hotspot, or 2. GPS satellite signal reception and available cellular data and/or voice connection; associated charges (incl. data plans, roaming charges and/or other amounts charged by your wireless carrier) may apply.